Printed Music Licensing Ltd (PMLL), which licenses the copying of printed music to schools throughout the UK, is delighted to announce a new venture for the company in 2018. PMLL will be sponsoring four scholarships for children over the next four years through the London Music Fund. The London Music Fund (formerly the Mayor’s Music Fund), for which the Mayor of London is the patron, offers talented young musicians from underprivileged backgrounds the opportunity to develop their potential in music and beyond. This exciting new endeavour reflects PMLL’s determination to support a flourishing musical landscape within the UK. The scholarships award £4,000 to each child and runs for four years. The first child that PMLL will be sponsoring is eleven-year-old Tyrique Gabbidon from South East London. Tyrique is an ambitious drummer, however, in order for him to develop his considerable talent, he requires 1:1 tuition and access to a wider spectrum of music centres. The scholarship not only allows Tyrique to explore and develop his natural drumming abilities through dedicated tuition but it also gains him access to holiday courses, mentoring, instrument hire and repair, exams, music workshops, access to weekly band sessions and other specialised training. 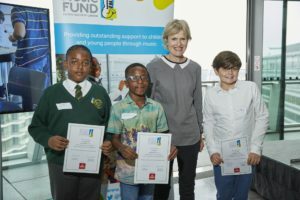 (Far left) Tyrique Gabbidon receiving his certificate from London Music Fund Ambassador and Oscar-Winning Composer, Rachel Portman OBE alongside two of the other recipients at the Scholars Awards Day in late 2017. With over 120 music publisher members Printed Music Licensing Ltd (PMLL) currently has one licensing scheme that allows schools to make copies of printed music publications and to arrange the musical works embodied in printed music publications. PMLL is part of the Music Publishers Association (MPA) group companies. British Music Publishers invest in musical copyrights by supporting songwriters, authors and composers and generates over a quarter of the UK music industry’s £2.5 billion in export revenue. Established in 2011, the London Music Fund (formerly the Mayor’s Music Fund (Registered Charity No.1141216) offers the opportunity to talented young musicians from underprivileged backgrounds the opportunity to develop their potential in music and beyond. The London Music Fund is the only dedicated charity in the UK working in this significant area, supporting young musicians at the very start of their learning. The Mayor of London is our patron.